Ask Yvette – What happened to the population registers from the 1900s? Several readers have asked me about population registers from the 1900s that they used to be able to view, but are no longer available. In May 2018, a new privacy law was introduced that was more strict about sharing information about people who may be alive. 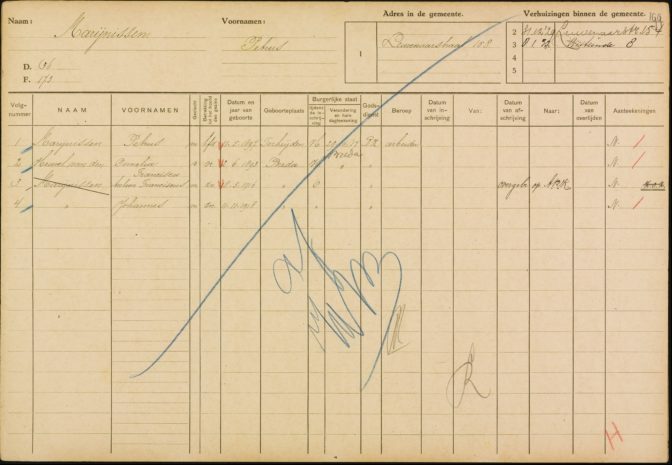 As a result, the Association of Municipalities in the Netherlands (VNG) recommended to take the population registers offline, and the archives association BRAIN recommended that they only be made public after 110 years. As a result, most archives have taken the records from the 1900s offline. Most registers span a period of ten or twenty years, and will only become public 110 years after the most recent date of the register. A 1900-1919 register would become available again in 2030. 1920-1938 registers won’t be available until 2049. You may be able to access the records in the reading room if you can show you have permission or you can prove that everybody has died. See Access to restricted records for more explanation. The good news is that some archives are working toward bringing some access back. Some archives are now publishing the index again, though not the scans since the scans contain information about religion. For alternatives, see Sources for researching people in the 1900s.